USANA, word! 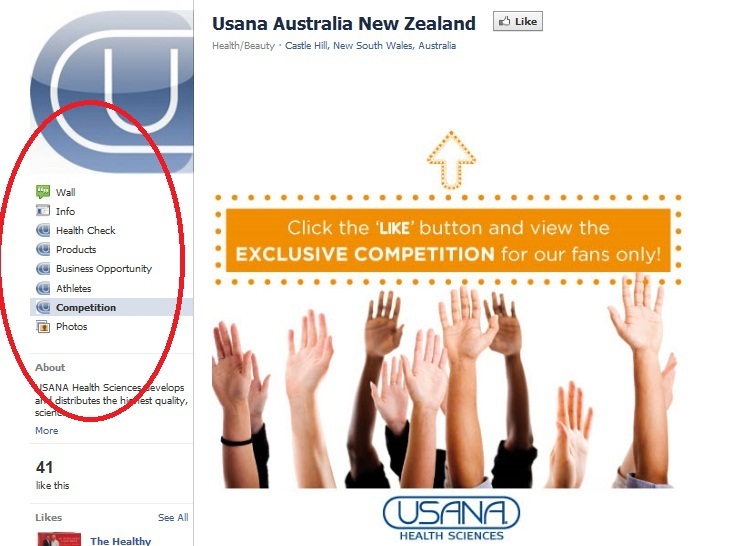 : Welcome To a ‘Likeable’ USANA Australia New Zealand Facebook World! We have got a new Facebook Fan Page! Funky design, easy access, detailed information AND an exclusive competition for fans only. Yes, it will be another communication hub on top of ‘USANA, word!’, Twitter and Youtube, in the USANA social media world. In the previous blog, we talked about Facebook and how to connect with us, and I bet you can’t wait for a tour of it. 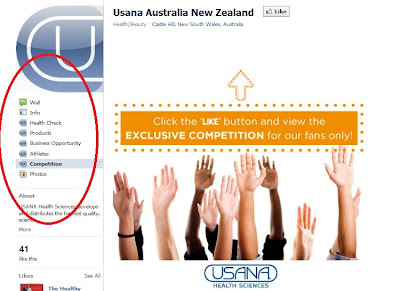 Let’s go to http://www.facebook.com/usanaaustralianewzealand and start the tour! This is the landing page. As you know, today is the first day of the competition. So if you haven’t joined yet, you may want to put your hand up right now by hitting the ‘Like’ button. You may have to log in if you haven’t already. You will be able to view the information of the competition, once you log in. Athletes – The world-class athletes trust USANA. Why not trust your health to the nutritional supplements they trust? You can navigate between pages by hitting the tabs located on the left side of the page (marked in red circle in the above picture). Each page will take you to the right information page you want to visit. However, you will need to select your country to proceed. But the good news is once this is selected, the internet browser will remember your country and you will not need to select it twice. Tabs like “Wall”, “Info” and “Photos” are exactly the same as before: The “Wall” page is a default page, which allows us to post our updates, the upcoming USANA events and share USANA adventure with our fans. Posts can be text, web links, photos and videos. “Info” is a default page as well, which gives you an idea on who we are and what we do. “Photos” is where we can upload our photos, either with our USANA Associates, or with Dr. Wentz. If you are stuck on how to use Facebook, anytime, Facebook Help Centre is a good resource which will answer all your questions. What can you do with the new Fan Page? Do you like this new page? Give us a ‘Thumbs Up’ to say you do!